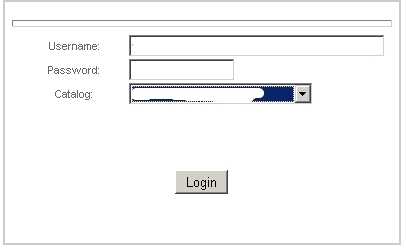 How to add and edit items in the ctAdmin interface. 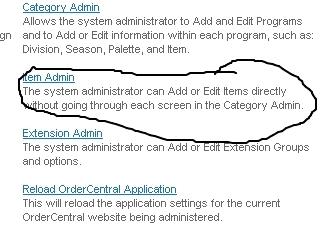 Below is a Guide to editing an Item in OrderCentral's ctAdmin interface. Note: Some options will vary from due to customizations. This should be used as a general guide to using the "Item Admin" interface. Go to the Item Admin. In the popup window, search by an invtID or description. Items listed with an itemID are already in the OrderCentral tables, items with a blank itemID are NOT in OrderCentral but are in Solomon. Entries with an itemID will go to the "EDIT" mode, other items will go into "ADD" mode. You can remove an item from a category by clicking the "remove" link next to the category. If it is an item WITH extensions (options) then you can remove an extensiongroup from an item by clicking the "remove" link next to the group. At the bottom of the screen you can set the image path for the thumbnails(searchpage results and category listings) or the main image for the product detail page. Make sure to check "active" if you want the product available on the site. When you are doing adding an item or editing an item, click the "Update" or "Add" button at the bottom.